This last weekend for Memorial Day, as we celebrated the freedom that we have on a daily basis, I am reminded to be thankful for it and all those who served and are currently serving to make that freedom possible. 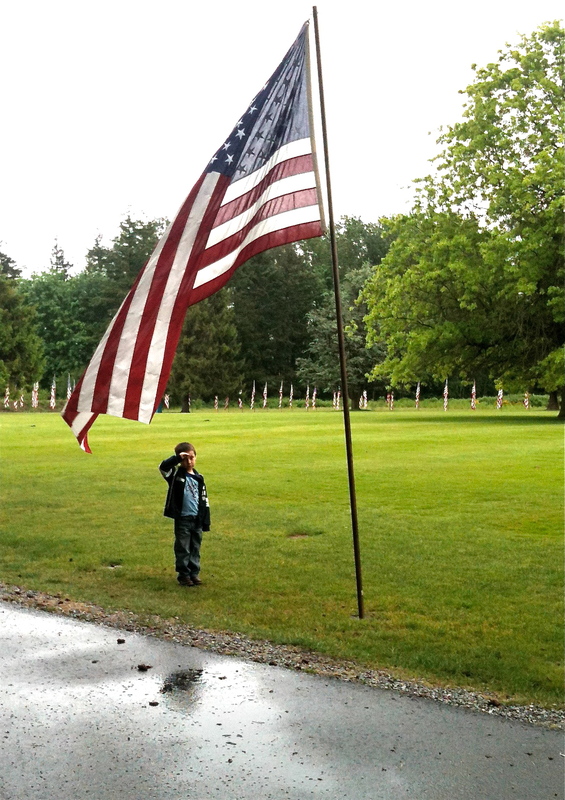 I know I was taken back when we visited a cemetary and my grandson knew what to do when he saw the flag. I caught it in a photo. You know, we talk about things with our family around and we think it might not matter. But I have found new answers to that question. It DOES matter. They ARE listening. Ethan is showing me that everyday I am with him. So think about the influence that you have around you and use it. Share it. It matters. You affect others. You may not see as I did that day, but it will present itself. So go ahead. Share what is important to you so just as you have memories of your parents or grandparents sharing their lives with you, or things you remember about their home or lifestyle, that you can now be that generation that will give a legacy of memories to our current generation. Thank you Ethan for that reminder! Stand tall, with honor; salute! Previous postWhat Does Your Daily Life Mean?